1.Wash and peel the potatoes. Cut them in cubes and boil in 2 cups of water until soft. 2.Cool for 5 minutes. Blend the potatoes along with the cooking liquid until smooth. 4.Drain the corn reserving the cooking liquid. Blend the cooked corn until smooth. Pass through a sieve, collecting the puree in a bowl and discarding the residue. 5.Melt butter in a saucepan over moderately heat. Add the asafetida and black pepper. While it sizzles, add the potato and corn puree. Add salt and the remaining cooking liquid from corn and/or potato. 6.Bring to a boil. Reduce the heat to low and cook uncovered, stirring often for 15 minutes. Serve hot garnished with parsley leaves. 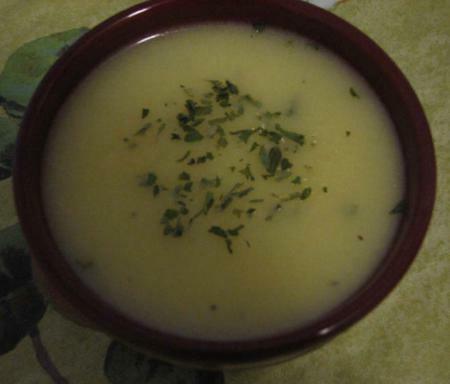 ** You may add 1-2 cups of more water if a thinner consistency soup is desired.